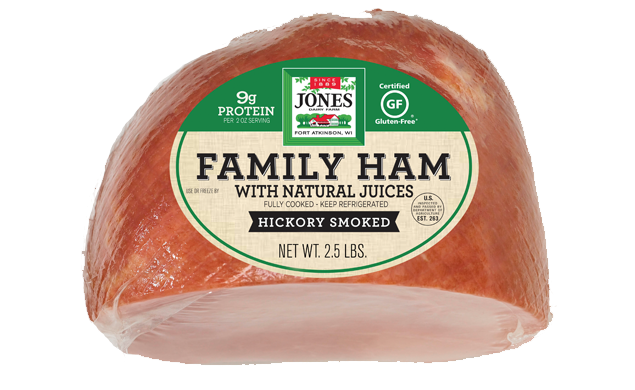 Learn how to make this autumn-inspired baked Jones ham with the flavors of apple, ginger and cloves. Combine apple jelly, apple butter, 1 cup brown sugar, ginger, and cloves in small saucepan. Heat over medium heat for about 10 minutes, stirring occasionally. Continue cooking until it reduces to 1 1/2 cups and becomes syrupy and thick. Set aside. Spray baking dish with non-stick spray. Score ham with sharp knife and set inside baking dish. 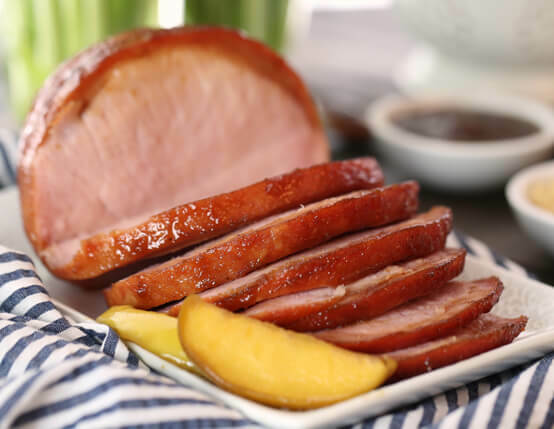 Pour apple juice over ham into baking dish and place apple slices around ham. Bake ham, covered, for 15 minutes. Take ham out of oven and pour 1/2 of glaze over ham. Re-cover and bake another 15 minutes. Baste ham with pan juices and bake another 10 minutes, uncovered. Take out of oven, pour another 1/4 of glaze over ham and press the 1/4 cup of brown sugar into ham. Bake until brown sugar caramelizes and internal temperature has reached 145°F. If needed, place under broiler for 2-3 minutes. Watch closely, sugar will burn easily. Slice and serve with remaining glaze.